What can I expect on the day of the Walk? You can expect to be a part of Canada’s biggest fundraiser for Alzheimer’s disease and other dementias. Join the movement and make a difference for people impacted by Alzheimer’s. Can I bring family members and/or friends? Yes! Invite your family and/or friends and join thousands of Canadians who want to see a world without Alzheimer’s disease. Start a team! Everyone will be touched by dementia, whether it’s a relative, a friend or someone in your community. Be part of the solution. Join the movement and make a difference for people impacted by Alzheimer’s. Do I have to raise money to participate? The IG Wealth Management Walk for Alzheimer’s is Canada’s biggest fundraiser for Alzheimer’s disease and other dementias. 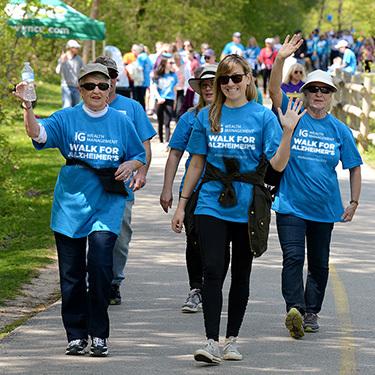 When you walk, you send a message of hope to the more than half a million Canadians living with dementia right now, and thousands more who care for them. When you fundraise, you promise them that help will always be available. What methods of payment can people who sponsor me use? You can collect pledges either online, or in person by using a pledge form. What should I do with the money and cheques that I collect? Offline pledges should be submitted the day of your Walk at your Walk location. All online and offline pledges will be reconciled at the registration desk at your local Walk. Please bring all offline pledges and the donation details on a pledge form. Will my sponsors receive a tax receipt? Yes! If they made a donation online, they will receive an automatically generated e-receipt. If they made a donation by cash or cheque, they will receive a tax receipt from the local Society after the IG Wealth Management Walk for Alzheimer’s has been completed. Will I receive a tax receipt if I sponsor myself? Yes! If you made a donation online, you will receive an automatically generated e-receipt. If you made a donation by cash or cheque, you will receive a tax receipt from the local Society after the IG Wealth Management Walk for Alzheimer’s has been completed. Thank you for your donation! Please note the minimum tax receipt amounts for each province are: AB $20, BC $15, MB $15, NB $10, NL $10, NS $10, ON $20, QC $20, PE $20, SK $10. How will the money I raised be used? Monies raised support programs and services in your community that improve the quality of life for people living with dementia and their families, and for other activities like education and public awareness. Can walking prevent Alzheimer’s disease or other dementias? As of today, we don’t fully understand the causes of dementia and have yet to find a cure. But mounting evidence suggests that regular exercise like walking helps lower the risk. Any physical activity that gets your heart pumping also benefits your brain.